Honestly, I'm so finished with this man! Sigh!!! Your search for attention is almost nil !!! LOL. Everyone deserves a good father, haha. What's wrong with keeping quiet, just look at Meghan's mom, sigh! LOL. Meghan's father has just spoken again, and it's for TMZZZZ, why? Why? LOL. 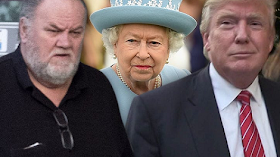 Thomas Markle believes that the royal family is putting him in the "punishment box" after his "Good Morning Britain" interview a week ago, especially since President Trump meets His Majesty before him. Thomas tells TMZ that he has not spoken to anyone about the palace since last week's interview. Not even his daughter, Meghan ... who, of course, has been busy with real things. Markle thinks she is doing the impossible, and tells TMZ ... "If the Queen is willing to meet our arrogant and insensitive president, she has no excuse not to know me, I'm not so bad at all." Trump is scheduled to meet with Elizabeth in the United Kingdom next month. Despite the perception of the difference ... Thomas says he still has every intention of crossing the pond to see Meghan, and finally meet Harry.